The history of the dachshund is somewhat muddled, with some groups claiming it was developed in the 18th and 19th centuries, others claim the 15th Century and still others cite drawings and mummies of dachshund-like dogs that were popular with ancient Egyptians. The modern-day incantation was developed in Germany, but was also influenced by French and English hounds and terriers. Dachshunds come in two sizes and three different coat types. The standard size dachshund weighs between 16 and 32 pounds while the miniature tops out at about 12 pounds. The coat types include smooth coat, longhair and wirehair. All three coats can be found on both the standard and miniature versions, and colors run the gamut from fawn and gray/blue to chocolate and black. A variety of patterns are acceptable too – two-tone, dappled, sable and brindle among them. The short-haired, smooth coated dachshund is believed to be the first of the three coat types to have immerged. The longhaired variety could have been developed through selective breeding or an out-crossing with spaniels. The wirehaired version, the last of the three to be developed, was likely created when smooth-coated dogs were crossed with terriers. The short legs and long body of the dachshund allowed it to enter badger dens where it would fight the ferocious creatures to the death. Possessing a keen nose and tenacious attitude, dachshunds were also used for hunting rabbits and foxes, as well as tracking wounded deer – something they still excel at today. The same tenaciousness it took to stand and fight a badger in its den hundreds of years ago can manifest itself today in a form of stubbornness, which can make dachshunds difficult to train. They can also be standoffish with strangers and will bark, and sometimes snap, at them and other dogs. While the dachshund has been a favorite of royalty in the past and was developed for hunting, today it mostly serves the role of family pet, companion dog and conformation competitor. However, some still compete in earth trials, and many owners attend “wiener dog races” throughout the country. In Germany, a few breeders still produce dogs for their original hunting use. 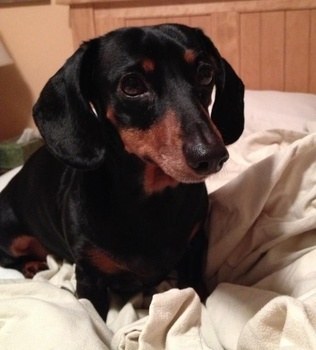 Because of their long bodies, dachshunds are prone to spinal problems – approximately 20 to 25 percent of dogs will develop intervertebral disk disease. Two other skeletal issues they are susceptible to include patellar luxation and osteogenesis imperfecta. A laundry list of other health issues plague dachshunds, and include: epilepsy, Cushing’s syndrome, thyroid issues, eye issues such as cataracts, glaucoma and PRA, as well as corneal ulcers, heart defects and color dilution alopecia. At Paw Print Genetics, we offer a dachshund-specific panel that includes screening of seven known mutations in the dachshund DNA. That panel includes such serious and debilitating diseases as: mucopolysaccharidosis IIIA (Group A), narcolepsy (Group A), neuronal ceroid lipofuscinosis 1, neuronal ceroid lipofuscinosis 2, osteogenesis imperfecta (Group A), progressive retinal atrophy, cone-rod dystrophy and progressive retinal atrophy, cone-rod dystrophy 4. If you order three or more tests by Nov. 3 and enter the code “FBDACH” at checkout, you will receive 15% off the cost of your order.